I have some EPP pieces I did quite a while ago.........hexi's, using Quilt Pati's the plastic or mylar hexi's that are all ready cut out with a center hole. I can't remember how I did them. On you tube everybody shows cutting the fabric 1/4 inch larger and basting each corner. That is not how I did them. Looking at mine on the back they are basted in the center so I have almost a double thickness of fabric and they look pretty good so I have to feel them to see which is the right side. But for the life of me I can't remember how I did them and can not find a you tube tute on how this method is done..........I know I didn't dream up this method on my own!!! lol, I'm not that clever. Has anyone else seen this method????? Can anyone point me in the right direction to watch a video of this? Maybe you started with a square? Here's a tutorial. That's not it but thanks anyway! Maybe I should just take one of them apart???? OMgoodness, what a brain storm I just had! In my post to EasyPeasy, I had the thought to take one apart........so I just did........drum-roll..........It's a 3" circle. Back to my drawing board, errr I mean cutting circles. GeriB if you find that book please post or send me a private email. Thanks. There are several you tube videos showing this method - I just typed in English Paper Piecing circle. Good luck. 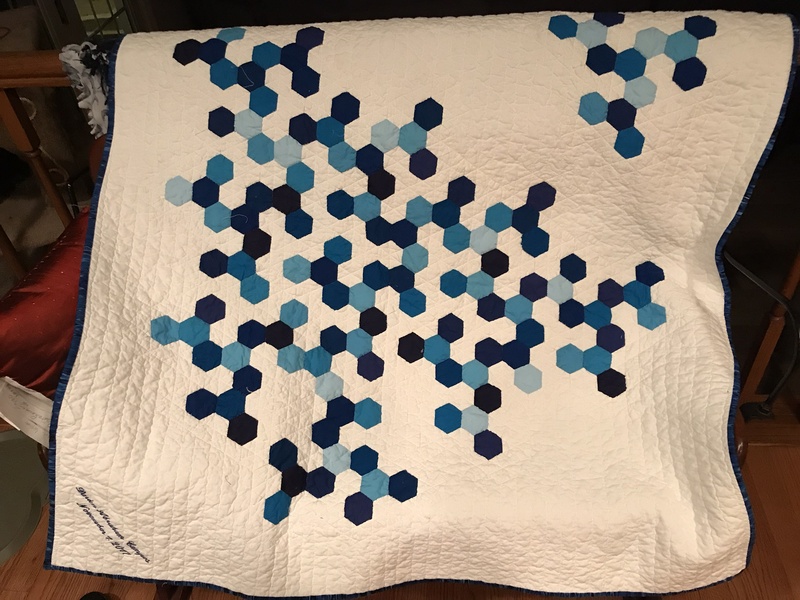 I just finished my first Hexie quilt (from [email protected]@@) I used the accuquilt hexie die cutter and it also cuts out the papers!! I used a f&p glue pen instead of basting. Those two short cuts saved hours. This pattern was from a fractal quilt free from https://patforsterblog.wordpress.com...ing-to-sydney/ if you’re into torture. Lol. The book that uses circles to make hexagons is Quick and Easy Hexie Quilts by Dr. P. Rhodes.